The beautiful, mountain golf course is owned by the property owners, but operates as a semi-private facility. 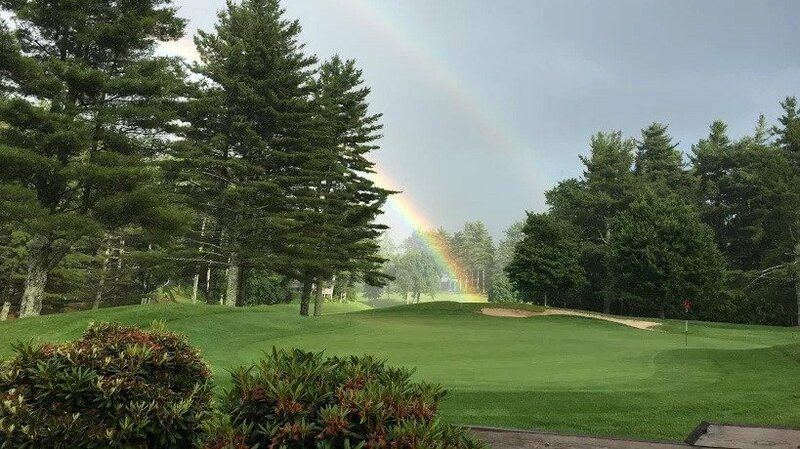 18 challenging holes with tree lined fairways, fast-paced greens, and several water features await golfers of all skill levels. The layout follows the native contours of the land, which creates a perfect setting for a challenging golf course with exhilarating views. Two distinct nines will test all aspects of a player’s game, but accuracy is crucial and well-rewarded from the 1st tee to the 18th green. The fast greens with their gentle contours will require a keen eye and soft putting stroke. Well maintained fairways will set up the ball with a perfect lie for the next shot, and if the ball happens to find the non-penal rough, the player will be able to recover without much trouble. The golf shop is stocked with moderately priced golf apparel and various golf accessories. Our golf professional will be more than happy to assist you with your selections and suggest equipment that’s best suited to your abilities. Our 19th Hole grill operates seasonally and offers plenty of food and beverage selections to fuel you and your game! A short, but strategic par 5 that doglegs left. The ideal tee shot hugs the left side and gives the opportunity to go for the green in two. Beware: only a narrow opening on the right side of the approach is the only bail out. Shots short of the green find the pond and shots over the green find the woods. Play smart to the approach and a close pitch will yield a good birdie opportunity. No driver needed off the tee here. 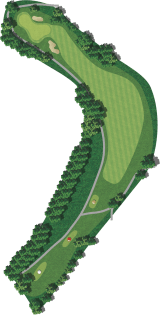 A creek bisects the fairway, so only a 180-190 yard carry is necessary off the back tee. The green slopes from back to front, so don’t be too aggressive with the approach shot or a downhill chip will make for a testy up-and-down! Perhaps the best par 3 on the golf course. The tee shot may play about ½ club shorter than the yardage, but make sure you carry the pond if the pin is on the front right. The green is well undulated, but not too severe. The last par 5 on the golf course requires accuracy off the tee. Tee balls left or right of the fairway will find rough, trees, or bunkers and take going for the green in two off the table. A generous approach at the green tempts the player who wants to go for it in two. Beware the bunkers at the green, and the undulations of the putting surface can create some interesting putts! A straightway par 4 with a generous green requires a smart, straight drive off the tee to avoid O/B on the left and a bunker on the right. Tee shots favoring the right half of the fairway will find a more level lie. The uphill shot into the green will require an extra ½ to full club, so use enough club. 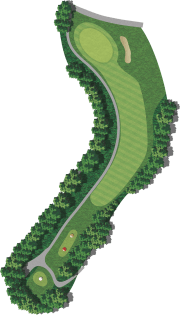 This short par 4 will tempt the long hitters to go for the green, but think twice! O/B stretches the entire left side, as well as behind and right of the green also. Don’t forget about the generous bunkering at the green either! Strategic players will hit a hybrid or long iron from the tee, leaving a sand wedge into the most severe green on the golf course. Happy putting! Our picturesque par 3 with Grandfather Mountain in view. A short iron downhill plays about a club shorter than the yardage. The green is shallow and well-bunkered, so a well lofted shot is required to hold the green. Bump-and-run shots must find the narrow, front-left opening in the approach. A tough tee shot is required on this dogleg left with yet another undulating green. A tee ball with a slight draw will take significant yardage off the approach shot. Playing safe to the broadest part of the fairway will leave a mid to short iron into the deepest green on the golf course. A back pin placement will require an extra club to get back there. Playing back into the golf house, #9 bends slightly right from tee-to-green. Hit all you want off the tee, but keep the ball in play; O/B left again and big white pines on the right side! A relatively flat green awaits your approach, but a back left pin placement requires extra touch on the approach! The downhill tee shot on this par 4 adds about 20-30 yards to your tee shot, so hit about a 200 yard shot from the white tee. Favor the right side, for a drawing tee ball may shoot across the fairway and into the bunker or deep woods. A severe, uphill approach is all carry so take enough club to carry the front of the green, or you’ll be chipping again! This uphill par 3 features a long green, but the left half of the green does not offer many pin placements. Ironically though, favor the left side with your tee shot because balls that start right or drift right will find trouble, or O/B if they hit Goose Hollow Road! One of, if not the toughest tee shot on the golf course. What you see is what you get: straight and narrow! Like #10, you will get 20+ yards off the tee, so 180-200 yard shot from the back tee gives you a good look at the green with a wedge. Trouble to the left at the green, so favor the right half. The shortest par 3 will need only a wedge off the tee. Don’t get greedy: go for the center of the small, flat green and you’ll have a fairly short, flat putt for birdie. Don’t go left or long, or plan on a penalty. A deceptively short tee shot that plays 2-3 clubs less than the 160 yards shown to the landing area. Play it more like 125-130 yards, then a short pitch into another small green. DO NOT CUT THE CORNER FOR SAFETY REASONS!! Trouble all around this green, so shoot for the center. A generous landing area in the fairway only requires a mid-iron off the tee, but keep it in the center to right center of the fairway for a good look at the green. Not much trouble at the green, so shoot for the pin. Oh how tempting! It looks like a long par 3, but you’ll walk away with a 6 or more on the scorecard if you’re not careful! Play the hole like the par 4 it is: short iron into the fairway, and a wedge into the green. Don’t be long and don’t go right or your ball will die a painful death. A severely sloping green from back-to-front will cause some knee-knocking, downhill putts. “Ernie’s Revenge” is named for Ernie Hayes, Land Harbor’s first manager, golf course superintendent, and architect of the back 9. A shot into the green will require about a 110-120 yard shot. Favor the left side if you think you’ll be a little long and it will hit the backboard behind the green. Ladies: this is a par 4 for you, so take a well-lofted club to clear the retaining wall, chip up and two putt for your par. A short, little, dogleg left finishing hole where you’ll only need about 130-140 yards off the back tee. A slight draw leaves you in the approach. Once again, please do not cut the corner for safety reasons! Your pitch into green should favor the left side, as balls will follow the contours to the right half of the green. Good luck putting here, ‘tis the most challenging green on the back nine!